I used to be stationed at a military base overseas where, at the end of every fiscal year, there was an intense flurry of expenditure by the base administrators, in order to spend every last penny in the annual budget. The reason for this was that the amount they would get to spend next year was dependent upon how much they spent this year: if they didn't use up everything they were allocated in one year, then the logic was that they obviously didn't need that much money, and next year's budget would be correspondingly reduced. So they had to find something to spend their money on. I remember especially how that worked one year when, with the end of the accounting period looming, the base administrators realized they had a chunk of money they had to spend out of the "Building Repairs & Maintenance" fund. They decided they would knock down the base social club, and build a shiny new one on the same spot. The problem was that building a new clubhouse could only be paid for out of the "Building Construction" budget, which was already used up for the year, while the money they actually had left to spend was in the "Building Repairs & Maintenance" account. (And you have to spend government money on the purpose it is allocated for, you can't just switch it between accounts). So to get round the problem, they completely demolished the existing club except for a skeletal framework of iron girders inside one wall. And then they built an entirely new building around these girders, and paid for it out of the "Repairs & Maintenance" fund. Because it didn't count as new construction so long as you left those pieces of iron from the old building standing hidden somewhere inside the new walls. The base administrators got to spend all their money, we got a brand new clubhouse whether we needed it or not, and everyone found it kind of funny in an ironic, "yes-it's-a-waste-but-everyone-does-it-with-government-money" kind of way. 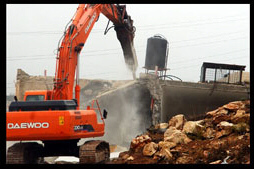 Yesterday, the Israeli Committee Against House Demolition (ICAHD) received information that the Israeli government was planning on demolishing houses in Anata, Beit Hanina and Silwan. Although the demolition of Palestinian homes was supposed to end with the first phase of the Road Map, Israel insists disingenuously that we are only in a "pre-Road Map" phase - even though the Road Map was initiated in mid-2003. This means, in Israel's interpretation, that the Palestinians must carry out all their responsibilities under Phase 1 and even Phase 2 (reform the Palestinian Authority, end violence, etc. ), while Israel is free to pursue its goals of strengthening its hold on the Occupied Territories without any interference whatsoever - a clear violation of the principle of "mutuality" that underlies the Road Map Process. -- "The Miserable Occupation On A Miserable Morning", via email from ICAHD. (Read the whole email online, here).